Home » Bovis give buyers £3,000 cash incentives to move into unfinished new homes. Outraged buyers have taken to social media complaining about Bovis asking them to legally complete on unfinished homes with no driveways, windows, paths, gardens, unpainted walls and even the wrong kitchen units being installed. The Facebook Group “Bovis Homes Victims” now has over 1,000 members, as media reporters and others join to find out what buyers are saying about the company on the Closed group. Rob Elmes, 32, told The Times he refused to accept an initial offer of £2,000 to complete on a three-bedroom £320,000 home in Worcestershire and was offered £3,000 four days later to legally complete on 23rd December. Mr Elmes refused, saying that his home was not yet finished with workmen still in the house and his drive unfinished. To compound matters, Bovis have even managed to fit the wrong kitchen! Bovis have admitted that customers had been offered an incentive to complete before the year’s end, but claimed that no one was forced to move in before Christmas. Bovis told The Guardian: “We recognise that our customer service has to improve and the leadership of the organisation is absolutely committed to getting this right.” This came just two days after Bovis CEO David Ritchie “resigned” who admitted a “limited number” of customers were offered an incentive to complete before the end of the year, but no one was forced to move in. 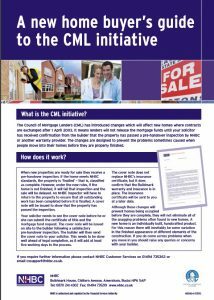 “Under rules introduced in April 2003, to help eliminate the practice of builders allowing occupation before the home is completely finished, the Council for Mortgage Lenders’ (CML) initiative requires builders to obtain a completion certificate. This is issued by an independent Building Inspector, normally the NHBC, following a satisfactory final inspection of the property. The lender requires this completion certificate, along with confirmation that the new home warranty is in place, before they release the mortgage funds. Could those Bovis buyers, in accepting the “incentive” payments and legally completing on an unfinished and uninhabitable new home, be innocently complicit with Bovis Homes, the solicitors and the warranty inspector in potential mortgage fraud? The homes would not have been in the condition on completion and therefore the full value, that the lenders believed. Even more, those bought using Help To Buy may have, proportionally, also defrauded the taxpayer! “We can’t comment specifically on these cases in relation to mortgage fraud, as I am sure you’ll understand. I think our members will be concerned about the emergence of this practice, [payments to buyers to legally complete on unfinished new homes] however – as you rightly point out, this practice shouldn’t be able to happen as the properties must be inspected and signed off as complete for habitation; the use of a cash incentive will also potentially distort the true value of the property if the valuer is unaware of it. Indeed it might; so I did. I asked the NHBC how it was possible for a CML final inspection certificate to be ‘signed off’ by the NHBC inspector? Especially when some of these houses were clearly far from finished requiring in one case, three months work! Another had not been decorated. Not exactly enlightening is it? Again, how is it that any of these homes are judged finished and “fit for occupation”? On 6th January, NHBC Chief Executive Mike Quinton quit after four years – three days ahead of David Ritchie’s “resignation” as Bovis’ CEO. You also have to question quite what, (if anything) the buyer’s solicitor entered into the CML “Disclosure of Incentives form” (Section 10) for those that chose to take the Bovis’ incentive! It would appear that Bovis are also manipulating the HBF Customer Satisfaction Survey. 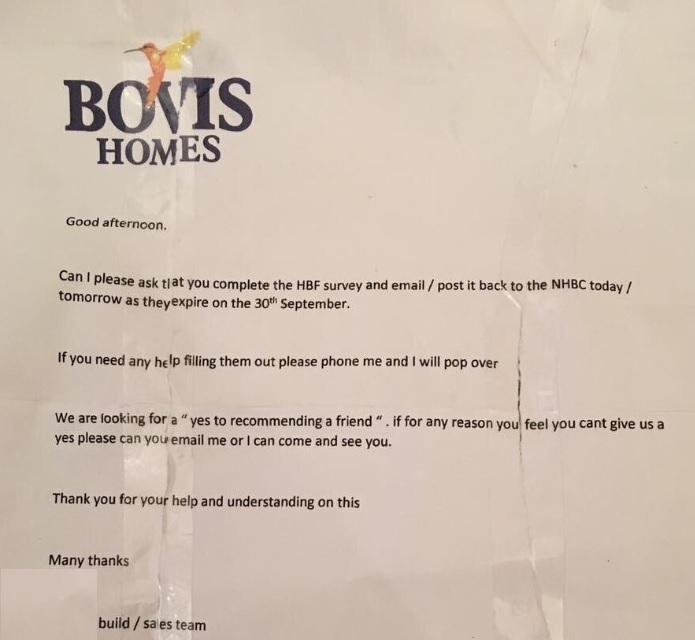 Bovis Homes, rated just three stars by its customers for the last two years, has allegedly offered John Lewis vouchers to buyers in return “for giving good feedback on the NHBC survey” Whilst not uncommon within the industry, this is clearly against the HBF Star Rating rules 21,22,24 and 25. Last Thursday Tom Knowles reported in The Times that the country’s biggest housebuilders were distancing themselves from the scandal, in particular Bovis’ claims that cash payments to buyers to legally complete on unfinished homes was “in line with industry practice. The scandal has led to Oliver Colvile MP, chairman of the All Party Parliamentary Group For Excellence in the Built Environment, to call for a debate into the standard of new homes, he said: “We will try to have a debate in the House of Commons about the quality of new-build housing. We need to press the government to do more.” In July last year, Mr Colvile and a group of MPs published their Inquiry Report detailing ten recommendations, which included my suggestion that buyers or their surveyors, have a mandatory right to inspect their properties before they complete their purchase. Many Bovis new home buyers have complained they were not allowed to enter their homes until the day of completion and on doing so, discovered workmen attempting to complete the works in time. Debate or no debate, it is to be hoped that the forthcoming Housing White Paper due later this month, does indeed take note of the ten recommendations of the APPG Inquiry Report and includes measures to address the ongoing quality and service shortfalls of the major housebuilders, especially by undertaking to set up an independent New Homes Ombudsman before the end of this year. It is my opinion that the buyers’ quotations in this article, reproduced entirely as they were originally written on posts freely available on Facebook, would be considered by a reasonable person, to be true and the opinions or experiences of these private individuals. This article is my honest opinion of the buyers’ own claims and statements that any reasonable person might also conclude. I believe this is a matter of public interest. This entry was posted in New Homes and tagged bovis, customer care, end of year figures, house builders, quality, solicitors. Bookmark the permalink.